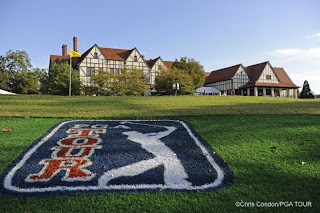 The Playoff finale for the FedExCup! It's a long week of assignments, but there are only 30 guys left in the field, so the golf is fairly easy to cover. Oh yeah, then we had a playoff! 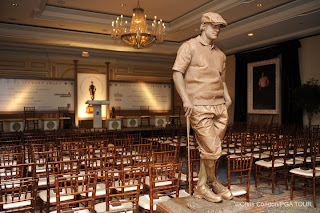 Tuesday night was the Payne Stewart award ceremony. The ballroom looked great, and they even had "live statues" on display. It was funny to see peoples' reaction when they realized the bronze guys were alive! 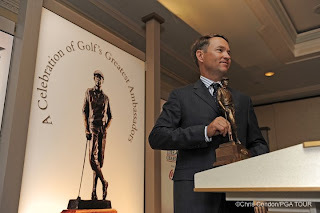 Davis Love III was the 2008 recipient. A class guy all-around and deserving of the honor. 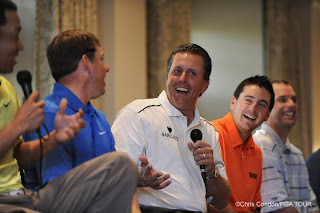 Several players took part in a panel discussion on Wednesday before the VIP outing. There was just a bit of ribbing going on. On Thursday morning Mr. Errie Ball hit the ceremonial tee shot. 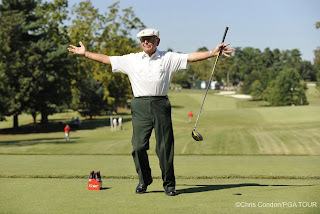 At 96 years old, he is the only surviving golfer who played in the inaugural Masters Tournament in 1934. He striped it right down the middle of the fairway! 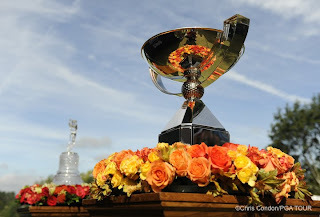 The FedExCup and tournament trophy were displayed on the first tee. 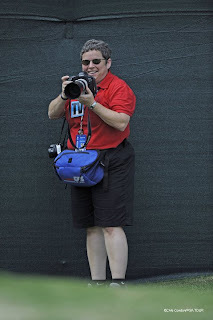 Caryn gets me in "stealth mode" as Casey Jones watches with mild amusement. Two can play that game. Right back atcha! 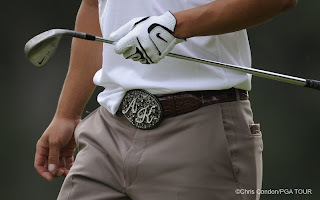 Anthony Kim tones down his belt buckle from the red, white & blue number he wore at the Ryder Cup. 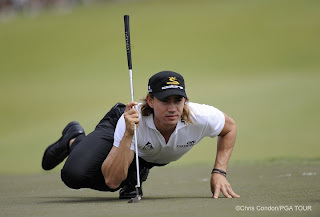 Camilo Villegas obliges me with a great "spiderman pose" with a clean background. It was good karma, he went on to win the tournament. 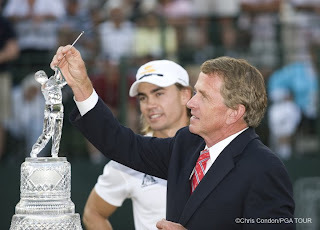 The club on top of the trophy has never stayed in place. The commissioner tries unsuccessfully to re-install it! Camilo won the tournament, but Vijay locked up the FedExCup by just showing up and playing all four rounds. 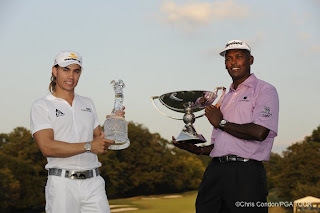 If Villegas had not missed the cut at Barclays, he could have been holding both pieces of hardware!